The Louis Vuitton Fall 2017 collection featured plenty of fashion girl staples — leather trench coats and satin slip dresses, anyone? 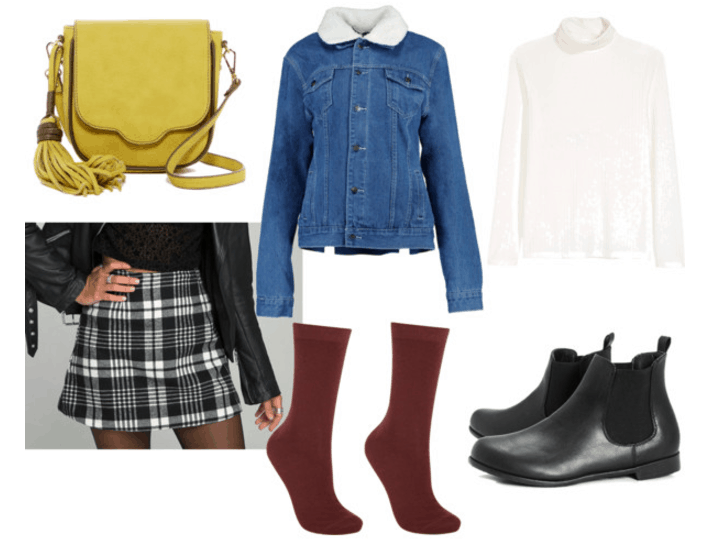 — but also some cute, casual looks you could totally copy on campus. Believe it or not, these looks are easily replicated on a budget. Below, I’ll share my favorite Louis Vuitton Fall 2017 outfits and how to get them for less. This little white shirtdress is the perfect piece for so many occasions. It’s ideal for wearing alone in warm weather, but you can also layer it with a turtleneck (!!) à la the Louis Vuitton model in cold weather. I’m obsessed and I need a little white shirtdress now. 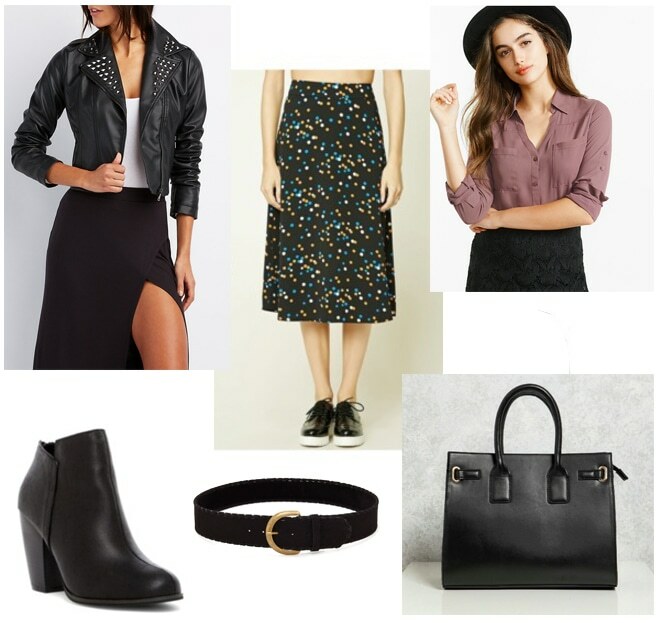 To recreate this look, pop on a shirtdress and add a grey turtleneck underneath. Accessorize with some black patent boots and an adorable yellow bag. Finally, wear this cute choker underneath – the flash of color will mimic the blocks of color on the model’s sweater. This Louis Vuitton Fall 2017 look mixes preppy and edgy to gorgeous effect. I love the swishy skirt paired with the structured, studded blouse. The combat boots add extra edge. So cool! Moto style jackets are huge right now, and I particularly love this studded one from Charlotte Russe. Pair it with a flowing midi skirt and demure button-down blouse to get the LV vibe. Belt the skirt at the waist, then just add a structured bag and a pair of boots. I love plaid skirts – of course, because they remind me of kilts. Shearling denim jackets will also always be in style, and this adorable preppy look is a perfect example of how to wear one. 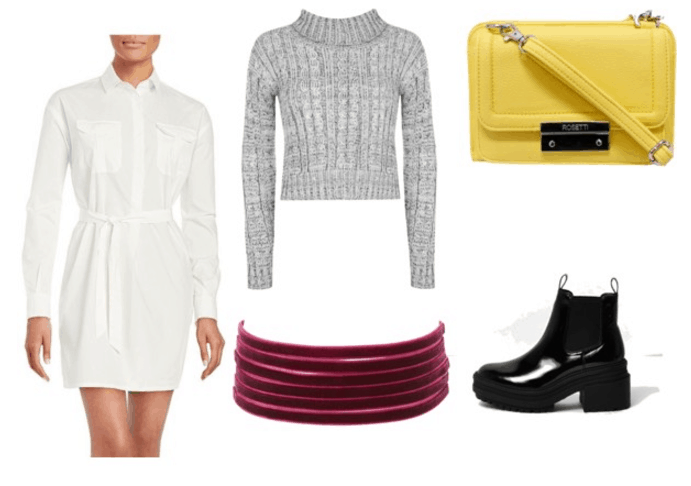 Pair the combo with another yellow bag, some cute ankle socks, boots and (another) turtleneck. How cute would this be for a day of classes? Do you like these looks? Which is your favorite? Let me know in the comments!